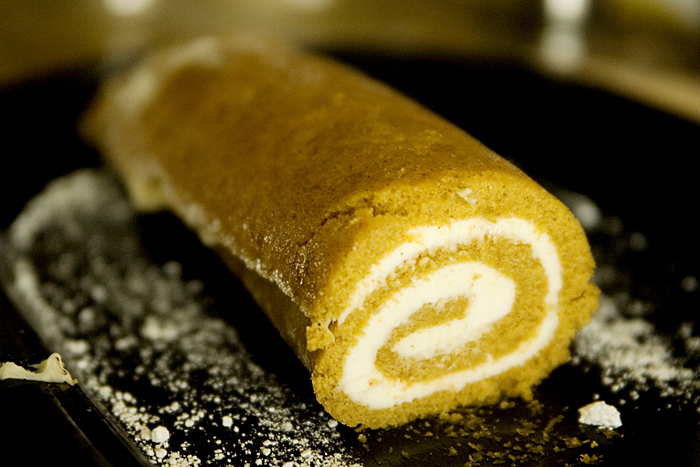 This pumpkin roll recipe will satisfy all of your fall dessert cravings. 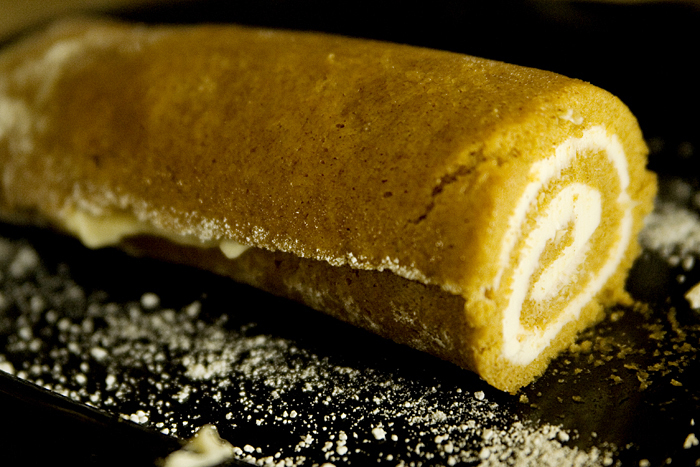 Delicious pumpkin cake rolled around a creamy cheese cake filling. Well, I got several recipes once I mentioned my craving a cream cheese filled pumpkin roll. First was from Jackie (an event coordinator in Indiana), so I decided to give hers a try. I had all the ingredients on hand, so I got started right away! I had no idea the unique method of making this, so I thought I’d document the process. It was late at night and I didn’t want to dig out my flash, so these are pretty dark. 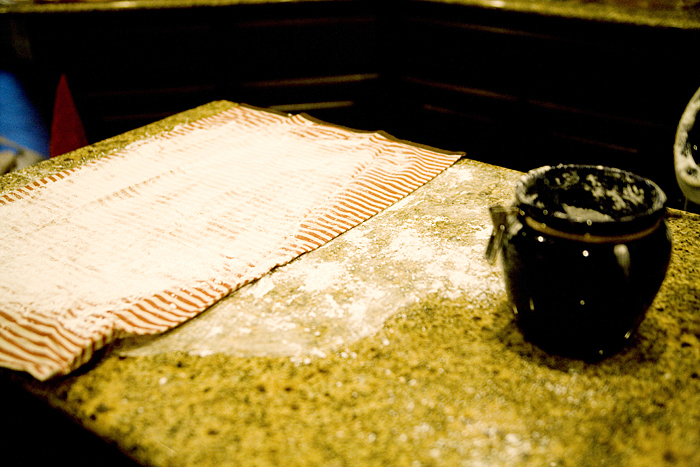 First you sprinkle the surface with powdered sugar and a clean dish towel on top of that sprinkled with powdered sugar. I was so confused how the dish towel played into the recipe, but it is a pretty handy trick! 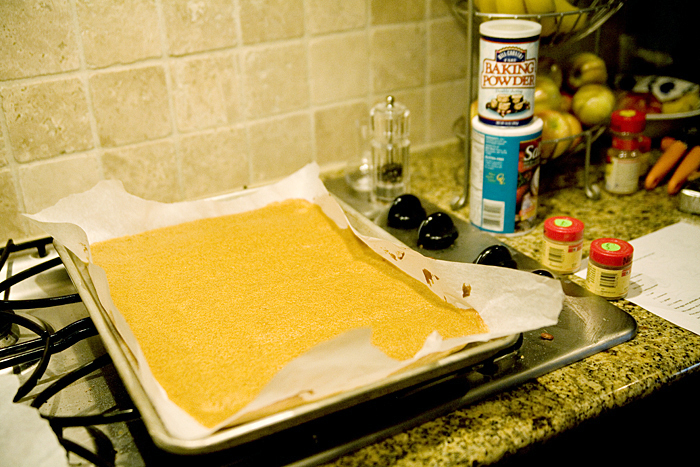 Then you cook your cake recipe on parchment paper on a jelly roll pan (cooks a thin cake). Then you roll up the cake IN the dish towel and let it cool for an hour. It seemed weird, but worked like a charm. 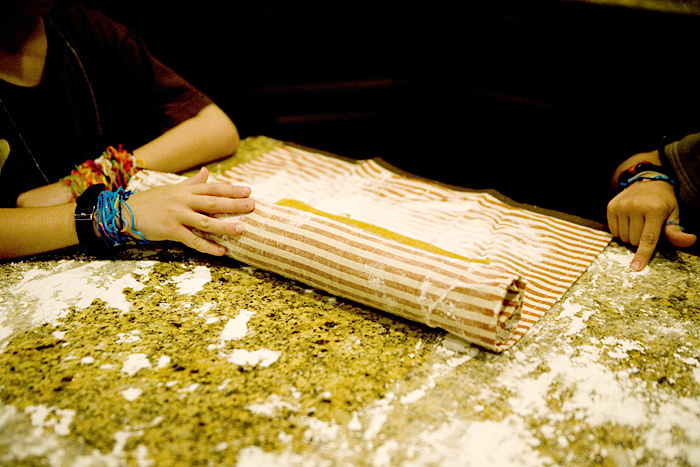 After the pumpkin roll cools, you unroll it. Next, frost the pumpkin roll with the scrumptious cream cheese mixture. 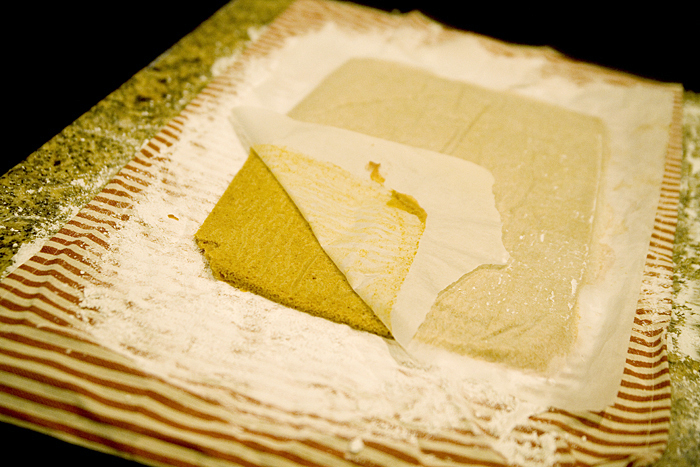 Then roll it back up. This time without the towel. Put the pumpkin roll on a plate and sprinkle it with a bit more powdered sugar. This pumpkin roll recipe is SO good! When I introduced this to my daughter I told her it was delicious. She replied that it was BETTER than delicious! I have to agree. I ate almost have of the roll myself! Pumpkin cake rolled around a cream cheese filling makes this pumpkin roll the perfect Fall dessert! Preheat oven to 375. 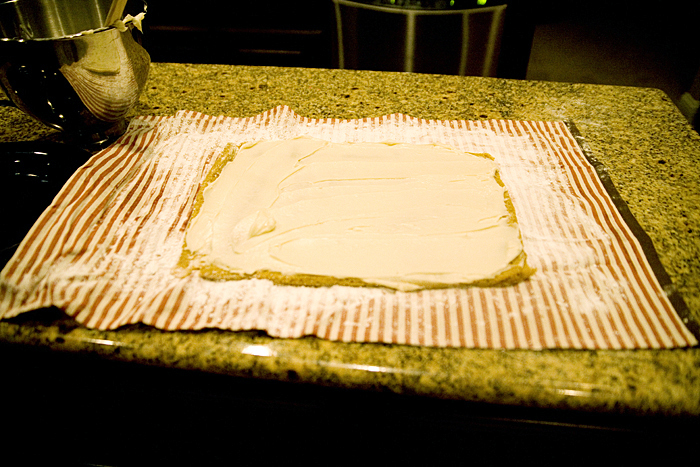 Place parchment paper down on jelly roll pan. Beat eggs and gradually add sugar. Add pumpkin and lemon juice and mix well. Set aside. Mix together dry ingredients. Add to pumpkin mixture and mix well. 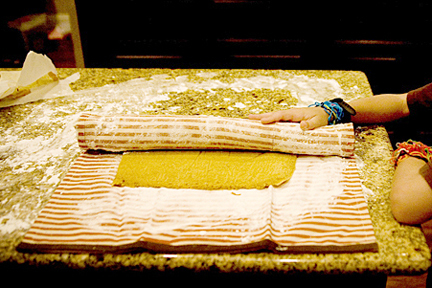 Pour into jelly roll pan and bake for about 16 minutes. 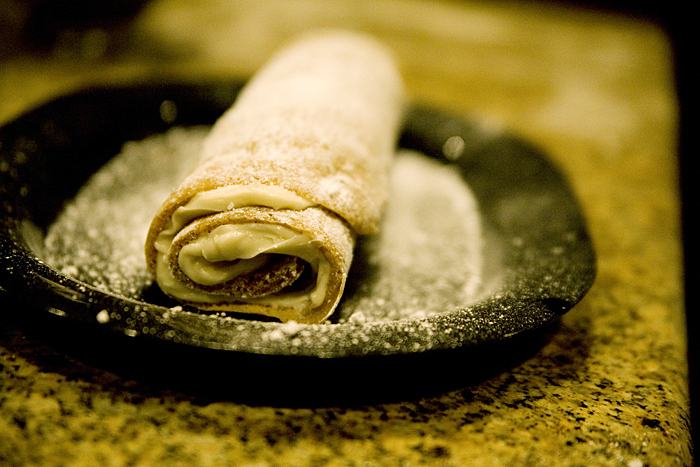 Immediately when removed, turn out on a dish towel generously sprinkled with powdered sugar (on both sides). 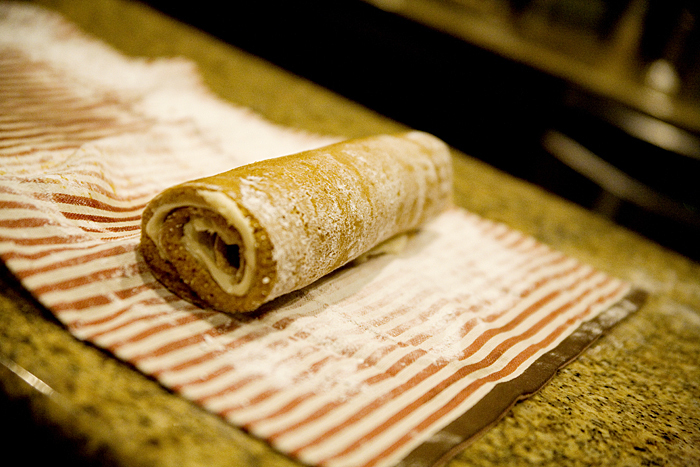 Roll towel and cake together and let cool to room temperature. While cake cools, make the filling by mixing together the cream cheese, butter, powdered sugar, and vanilla until fully combined. Once cake has cooled, carefully unroll cake, cover cake with cream cheese filling, and re roll.